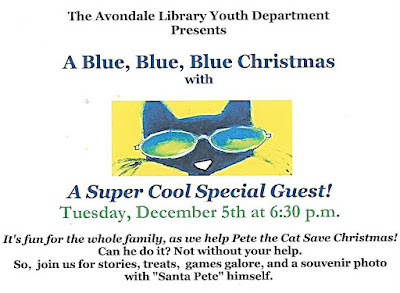 Family Fun Night at the Avondale Regional Branch Library on Tuesday, December 5, 6:30 p.m., features a super cool special guest: Pete the Cat! 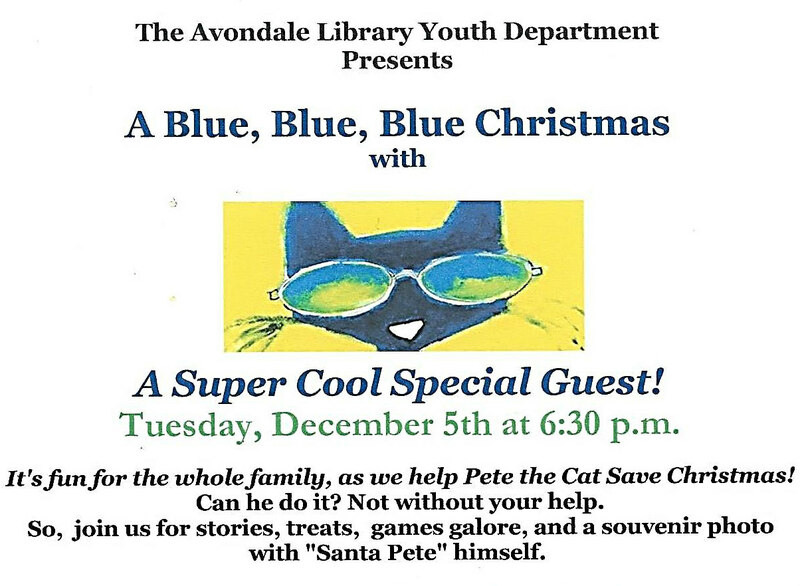 Help Pete the Cat save Christmas and then enjoy stories, treats, games, and even get a souvenir photo of "Santa Pete." Registration is required. Please register online through the Birmingham Public Library events calendar or call Avondale Library at 205-226-4003. An exhibit from the collections of the Birmingham Public Library Archives will be on display at the Central Library’s Fourth Floor Gallery from December 4, 2017, through February 2, 2018. 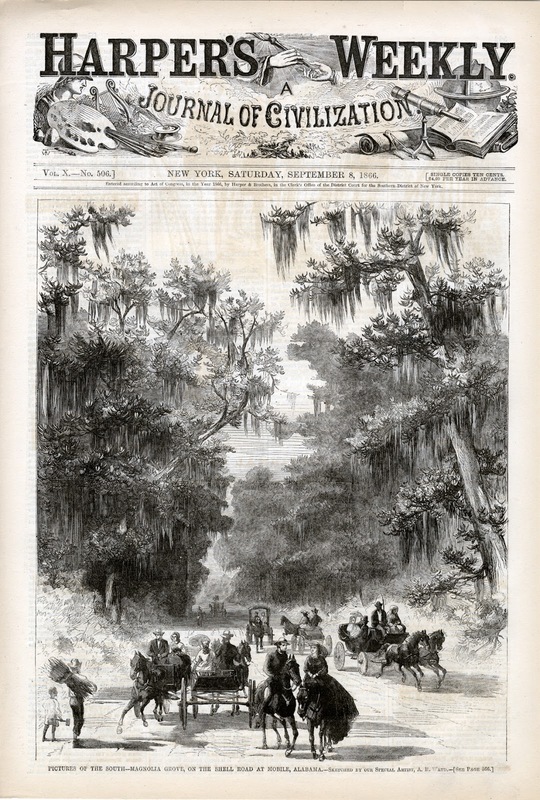 Titled Alabama Illustrated: Engravings from 19th Century Newspapers, the exhibit features images of Alabama people, places, and events that appeared in national and international newspapers from the 1850s to the 1890s. 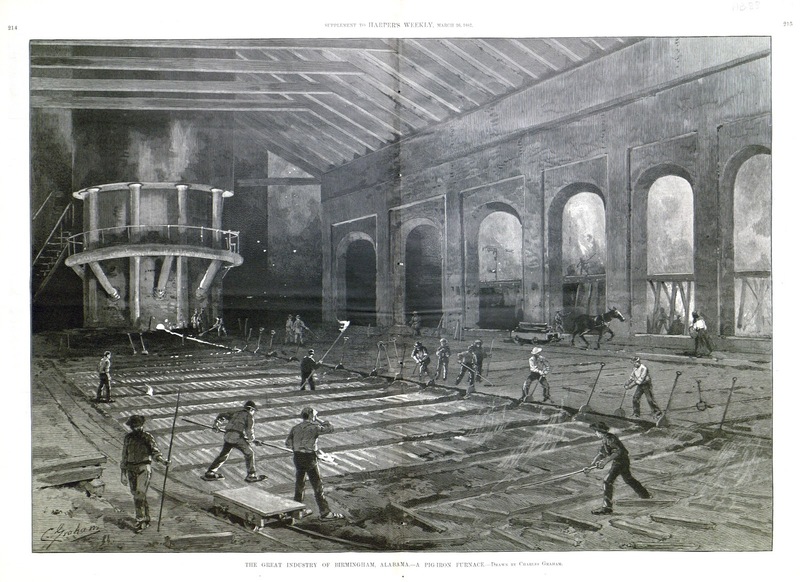 Prior to the 1890s, the technology did not exist to reproduce photographs in newspapers inexpensively. To provide illustrations for their readers, national and international papers like Harper's Weekly, Frank Leslie's Illustrated Newspaper, and the Illustrated London News sent artists around the world to draw pictures that were then engraved onto copper plates and printed in the newspapers. Many of these artists visited Alabama, and this exhibition features 28 examples of their work. BPL Archivist Jim Baggett will offer a free gallery tour on Sunday, December 10, 2017, at 3:00 p.m. Reservations are not required. 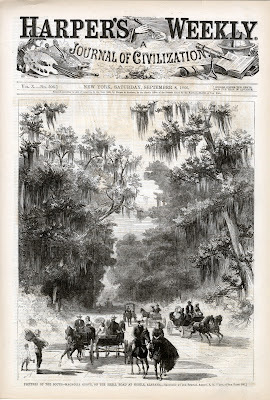 An accompanying book, Alabama Illustrated: Engravings from 19th Century Newspapers by James L. Baggett and Kelsey Scouten Bates is available from Turner Publishing. For more information contact Jim Baggett at 205-226-3631 or jbaggett@bham.lib.al.us. 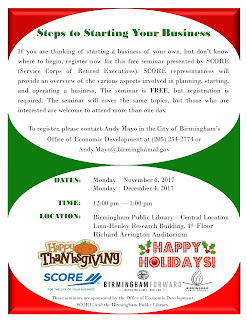 The Birmingham Public Library, in conjunction with the Service Corps of Retired Executives (SCORE) and the City of Birmingham’s Office of Economic Development, will host the monthly seminar Steps to Starting Your Business in 2017. The final seminar of 2017 is scheduled to be held on Monday, December 4, from 12:00 to 1:00 p.m., in the Arrington Auditorium, which is located on the 4th floor of the Linn-Henley Research Library. Each seminar will cover the same topics, but those who are interested are welcome to attend more than one day. Topics covered will include crafting a vision statement, identifying sources of funding, determining the legal structure of your business, devising a business plan, and investigating sources of business and economic information. 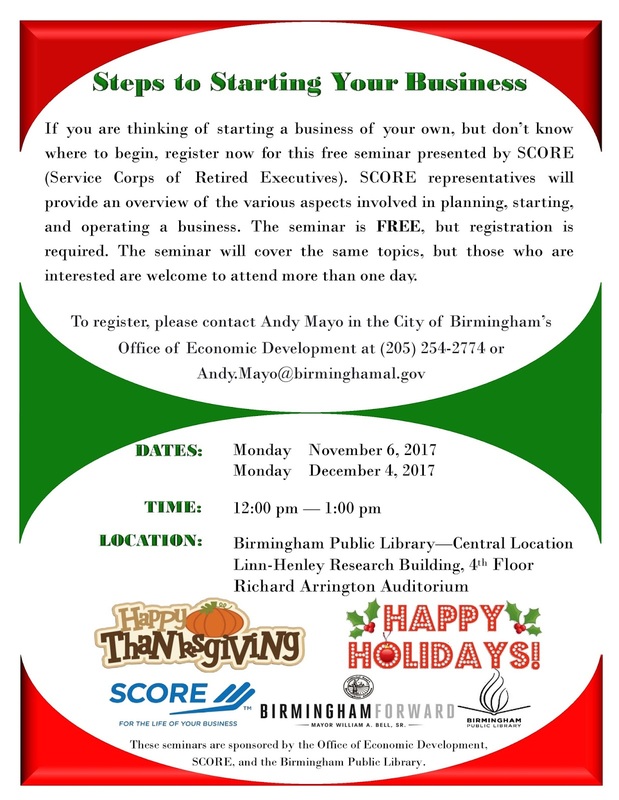 Please register for the seminars by contacting Andy Mayo in the Economic Development Office at Andy.Mayo@birminghamal.gov or 205-254-2774. Seminar presenters will be veteran mentors from the local chapter of SCORE. SCORE is a national nonprofit association consisting of volunteers with business skills and experience who want to share their knowledge with prospective entrepreneurs and small business owners. For over 50 years, SCORE mentors have helped millions of Americans start and grow their own businesses. For further information about the seminars or about resources available at the Birmingham Public Library relating to small business development, please contact Jim Murray in the Central Library’s Business, Science and Technology Department at jmurray@bham.lib.al.us or by phoning 205-226-3691. 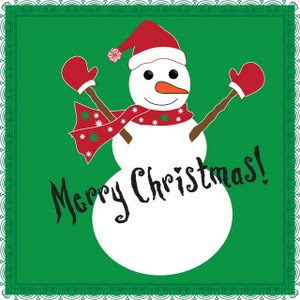 Would you love to make a homemade greeting card for that special someone this holiday season? Are you looking for a way to explore design and express your creativity? Well, look no further. 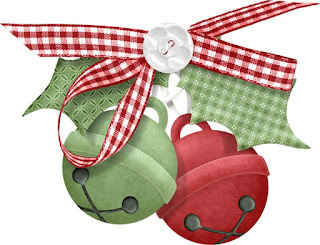 Join us for a festive, fun and creative class as we make seasonal homemade greeting cards. What better way to get into the holiday spirit? We’ll have fun combining various papers, colors and designs to make unique creations. Supplies and refreshments will be provided. Just bring your creativity! Registration required. Limit 12 participants. To register for the class, contact Leslie Deason at (205) 226-3677 or email her at ldeason@bham.lib.al.us. I’ve been fascinated by Diane Arbus for decades, but I’ve long been frustrated by the fact that a first-rate biography has never come out. When Arthur Lubow’s account surfaced in 2016, I had hopes that this might be it. It took some review reading and some attempts at immersing into it to realize that this was in fact the biography I’d been waiting for. I’d always wondered how a sheltered young New York woman from a rich family ended up taking portraits of those on society’s margins—street kids, homosexuals, transvestites, circus and sideshow performers, mental patients and so on-in the '50s and early '60s when such people were held at arms’ length by the mainstream, and were considered “freaks,” the consensus term of that time. Diane was the one that photographed freaks, they said. Some said she exploited them. But her pictures of these, and plenty of more conventional people, would propel her into the limelight and help transform photography from documentation and craft into art. That we talk of photography today matter-of-factly as an art form is due in no small measure to her. Diane Arbus was always different. Despite the cosseting of her family, she dated mostly guys her parents disapproved of and married one of them at an early age, foregoing college and economic security. With her husband Allan Arbus, she got a solid grounding in picture taking, leaving him in the late '50s to become a single mother and freelancer. Curiously, she always had a fraught relationship with mechanical objects. Paradoxically, this somehow became a strength, freeing her to use cameras in ways her peers seldom did. Though very ambitious, she accepted her quirks and drawbacks and channeled them into her work. Instead of quitting when fear arose, she plowed ahead and realized that however weird her portrait subjects might seem, actually meeting and getting to know them was easier than the initial decision to pursue them. She had enormous charm, a little girl personality that was readily available and an ability to make anyone comfortable. She could make almost anyone drop their guard, their public mask. It’s amazing now to read about anyone, especially a single woman, making it as an artist in New York City. Though Diane did get financial help from Allan after she left him (and would occasionally get handouts from her parents), she largely supported herself and two daughters. You could do that in New York in those days. Bohemia hadn’t been economically wiped out of Manhattan. But Lubow always reminds us of what a grind it was, how little photography paid then, how many editors nixed her pictures. And you want to see all of them, no matter how mediocre they might have been. It’s nothing short of astonishing that Lubow has been able to uncover the wealth of data he has when you realize that, since Diane Arbus’ death in the early '70s, her daughter Doon has built a virtual blockade around her estate. It’s because of this that no Arbus photos are in the book (though there are photos of Arbus, family, friends, and lovers). A table of Photographs Discussed In The Text is in the start of the book. Unfortunately, the list only covers about 80% or so of the photos discussed in the book. This is the only significant problem with the book. The thing to do is get a copy of Revelations by Diane Arbus, a posthumous collection of her photos that surpasses all other collections. If you’re even moderately interested in Arbus, you’ll want to look up the photos as you read this book. Lubow is excellent at making you want to do so, and look again at the pictures you thought you knew. He helped me to see new aspects of familiar photos (even ones I thought I couldn’t see anew anymore) and ably introduced me to not-so-familiar ones. Arbus was a genius at capturing the right details, and Lubow gets us to notice these. One reason Arbus is key is because she broadened our view of American people. She brought into her fold individuals who’d previously been considered unfit to see or acknowledge. She made them her friends. Not her inner circle of friends, but friends nonetheless. She let them look at us through her pictures, and this helped at least some to realize that these were people of worth. She portrayed them not as noble, without sentimentality or condescension. They were what they were. That was enough. That was a very brave thing to do. She nearly always got them right. There’s something very admirable and courageous about this, but Arbus was very far from saintly. She had many flaws, and Lubow catalogs them, shows how they compromised her, dragged her down. It wasn’t all marginals, though. She often photographed well-known politicians, celebrities, and scene makers too. She could uncover hidden truths in most all of her subjects, and it sometimes (perhaps regularly) happened that her subjects regretted letting her take their picture. She didn’t recognized boundaries or taboos. She moved the hidden into the light, even with the well-known. Lubow sympathetically (but not uncritically) shows us how she did it all this. America is always a lot larger and more diverse than we think it is, or that we’re willing to admit, and Arbus is one of those pathbreakers that helped us see this. Details: Free and open to the public. Refreshments will be served. 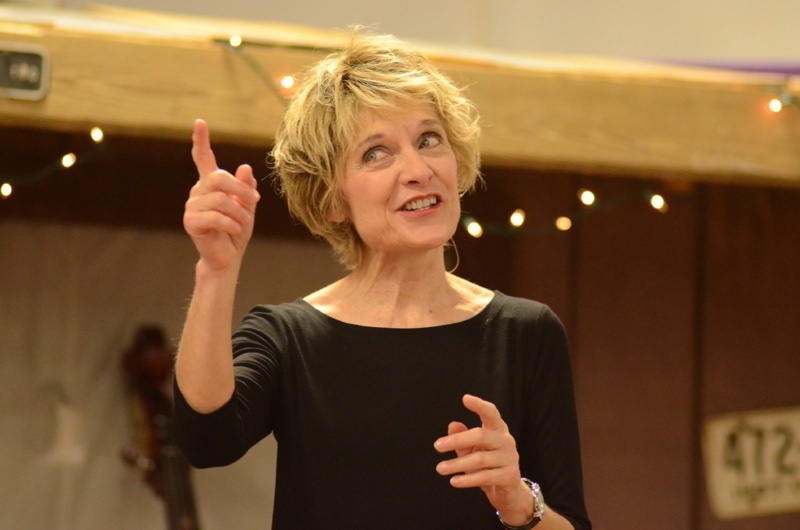 The Christmas season doesn’t really begin until you have experienced Birmingham storyteller Dolores Hydock’s incredible one-woman performance of "A Christmas Memory," Truman Capote's poignant reminiscence of his boyhood in rural Alabama. Dolores will perform this holiday classic on Sunday, December 3, 2017, at 3:00 p.m. in the Arrington Auditorium at the Central Library. There is always a full house for this performance, so come early and enjoy refreshments. The December computer class schedule is available. All classes are free but registration is required. For class descriptions and to register online, visit the Birmingham Public Library events calendar or call the Computer Commons Department at 205-226-3681. These days you can explore the library without leaving your home. Over the last couple of years I have downloaded several apps to my iPad and my Android phone to take advantage of downloadables from the library. This way I can use library services day and night, even from my bed. 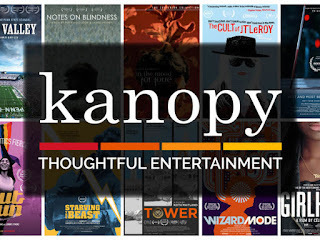 One I've been exploring lately is Kanopy, which is a video streaming service for libraries with a collection that is described as being five times larger than Netflix—over 30,000 films. When you enter Kanopy, you quickly get an idea of what's available. It is a little more highbrow than Netflix because it includes a wide variety of independent films, world cinema, short films, classic films that are not necessarily what you see on Netflix or TCM, art house films, true crime, horror, as well as The Great Courses. There are lots of documentaries—food for thought on such subjects as human rights of all kinds, pop culture, guns in America, women leading social causes across the world, and more. There is a whole list of Ken Burns films as well as New York Times critics picks. You can pick from movies, documentaries, the arts, business, education, global studies and languages, health, media and communications, science, social sciences, and instructional films and lessons. And it's all free. Right now I am mostly into entertainment, so my "watch list" includes several independent and foreign films that I haven't come across at local theaters or on television. Last night I watched Ken Burns' two-part insightful portrait of the life of Thomas Jefferson. So far I've enjoyed everything I've watched. Of course you can opt out at any time if you start something you find you don't like or can't finish. Add Kanopy, hoopla, Freegal, Flipster, Mango, Overdrive and Libby (Overdrive app) you have a whole world at your fingertips. Your favorite librarian can help you access this world if you have any problems. P.S. Support BPL on #Giving Tuesday so we can keep downloading in the middle of the night. #Giving Tuesday is a global giving movement that inspires people to take collective action in their communities to give back to the causes they believe in, and help create a better world. #Giving Tuesday demonstrates how every act of generosity counts, and that they mean more when we give together. Show your support for Birmingham Public Library and our community on Tuesday November 28. 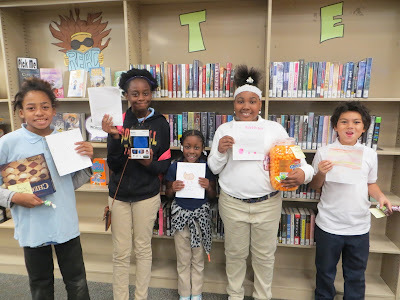 Teen Read Week was celebrated in a big way at the North Avondale Library. 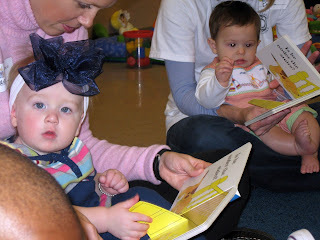 Although it was Teen Read Week, we had younger kids eager to participate. All participants were encouraged to create their own story in handmade books. There were stories created about bubble gum floors in a pink castle, "The Girl without a Cell Phone," "My First School Fight," and a variety of others. Elaborate book covers were designed to bind these delightful and creative stories. The covers were decorated with handmade drawings, construction paper cutouts, yarn, glue, and markers. For added fun the kids were given an opportunity to present their stories and their names were entered into a drawing for prizes. 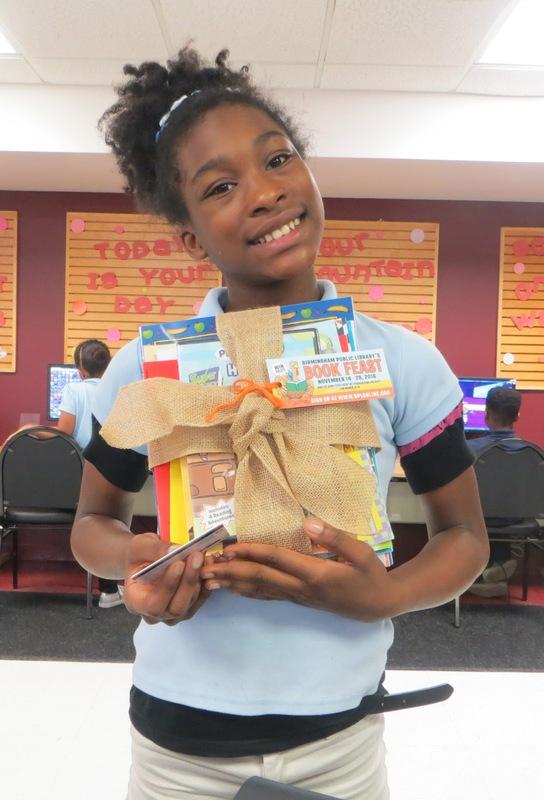 The library staff was thanked by the kids and expressions of enjoyment were given. When Alabama and Auburn face off November 25 in the 2017 Iron Bowl, they will be continuing a tradition considered one of the most important football rivalries in the annals of American sports. 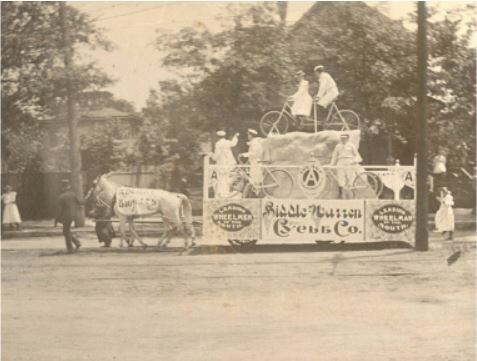 That tradition began nearly 125 years ago in a field not far from the Avondale Library. 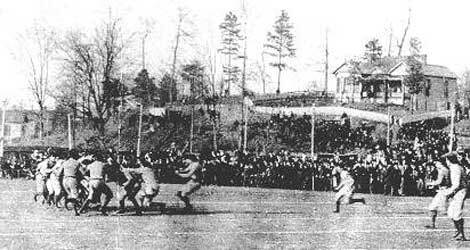 The very first Alabama-Auburn football game was played February 22, 1893, in what was then Lakeview Park. 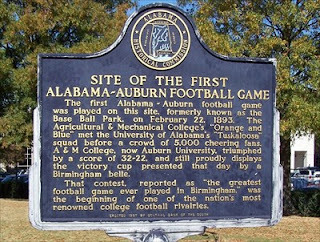 The game was played before an estimated crowd of 5,000 and was won 32-22 by Auburn (then named the Agricultural and Mechanical College of Alabama). The victory cup presented that day by a Birmingham Belle is on display at Auburn University. On Thursdays I like to share tidbits of local history like this on Avondale Library’s Facebook page. If you’d like to find out more, check out Avondale Library’s Throwback Thursday posts and BPL’s Digital Collections. For people who enjoy good eating, this time of year is worthy of celebration in song: “Food, glorious food!” Perhaps you like a home-cooked holiday dinner, or maybe your family prefers going out to a restaurant to celebrate. 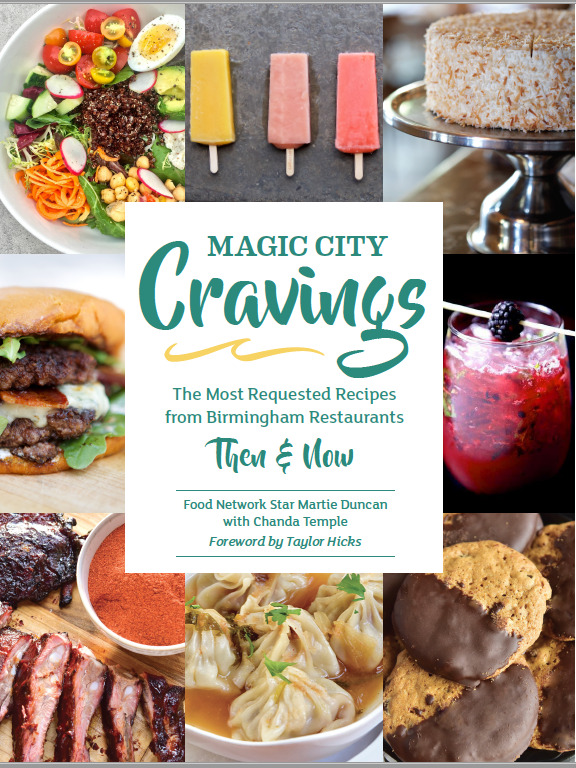 Magic City Cravings will appeal to both preferences as it serves up a smorgasbord of recipes from Birmingham restaurants—the best of yesterday and today. If you’re nostalgic for some of those Birmingham dishes you thought you’d never taste again, head straight for the chapter “Gone But Not Forgotten Favorites,” in which you’ll find treats like the Ensley Grill Cinnamon Rolls, Joy Young’s Egg Foo Young (remember when Joy Young was the only Chinese restaurant in town? 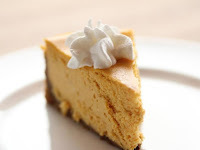 ), Marsh Bakery’s Coconut Cake, and the She-Crab Soup from Cobb Lane—supposedly lauded by Julia Child as the best she’d ever eaten. Quite a recommendation. In addition to the recipes, there’s a culinary history of Birmingham that includes “Greek Restaurant Roots”—if you’ve lived in the Birmingham area for very long, you’ve probably eaten at a restaurant owned by one of the Greek families that have left their mark on Birmingham cuisine, ranging from Pete’s Famous Hot Dogs, originally run by Gus Koutroulakis, to George Sarris’ Fish Market. Other ethnic influences on the Birmingham food scene include numerous Italian, Chinese, Jewish, Indian, and African American families. And Birmingham’s love affair with food continues to this day, as evidenced by the excitement over the recent opening of the Food Hall in the former Pizitz Building downtown. People who are new to the Birmingham area would probably find the “Where to Eat What” chapter very useful with its suggestions on how to locate a good meal, whether it’s breakfast or brunch or happy hour, or even “Late Night Bites.” What type of food do you crave? Check the listings for “Meat-And-Three”: A Birmingham tradition: meat and 3 vegetables for the uninitiated—and by vegetable, we mean mac ‘n cheese. Maybe you’re hunting for “A Great Burger” or “Decadent Desserts.” And great food doesn’t have to have one fixed location; be on the lookout for fantastic offerings via Food Truck from Big Spoon Creamery or Snapper Grabber’s Coastal Kitchen. There’s also a handy map of Birmingham area neighborhoods to help you locate your choices more easily. So whether you prefer fine dining out or home cooking for your holiday meals, reserve some time to take a look at Magic City Cravings; if it doesn’t make you lick your lips and go “mmmm,” you should have your doctor check to make sure your taste buds haven’t shriveled up and died. Enjoy a delicious holiday season! Thanksgiving is a wonderful holiday for fun activities such as eating, shopping, watching football, and spending quality moments with friends and family. For the second straight year, the Birmingham Public Library (BPL) is hosting the Book Feast Reading Challenge, a program designed to make sure Birmingham area school children don’t leave out another important, fun activity: reading. 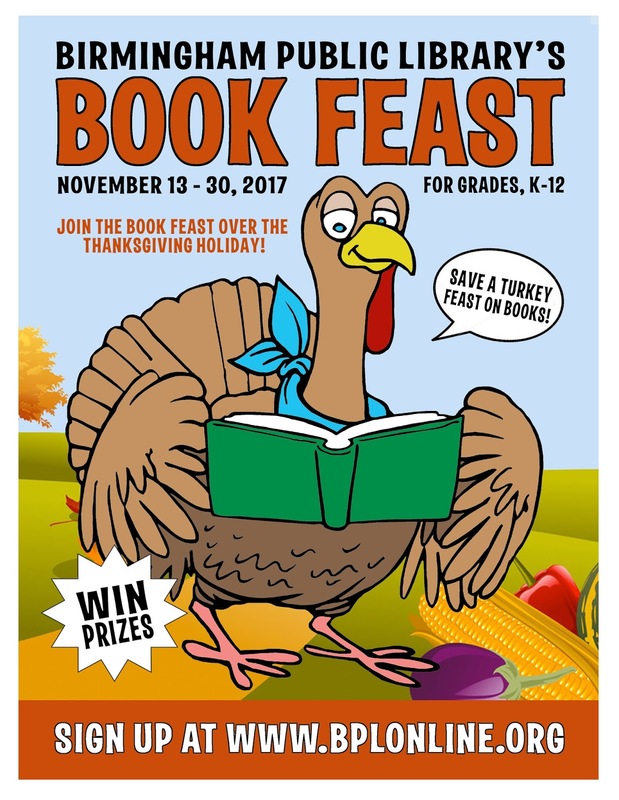 BPL is encouraging students in grades K-12 to participate in its online Book Feast Reading Challenge between now and November 30, 2017, by registering at this link: https://bpl.beanstack.org/reader365. The more books you read by November 30, the more virtual badges and awards you can win. All student participants who register online will be entered into a drawing for a special prize gift pack to be presented at each of the 19 BPL locations to those who read the most books. Smithfield Library Thanksgiving Basket Giveaway – Check out five books at Smithfield Library to enter into the drawing. The winner will be drawn at 4:30 p.m. on Thursday, November 16. 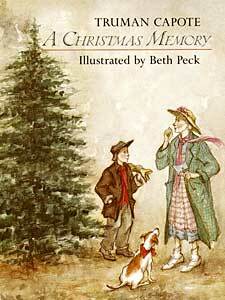 Tot Time with Mrs. Eve: It's Turkey Time, Avondale Regional Branch Library, November 20, 11:00 a.m. – Gobble gobble! Mrs. Eve is thankful for great libraries, library families, and the opportunity to share these wonderful holiday stories with you! Tot Time is designed for 2 to 4 year olds, with a parent or caregiver; no groups, please. Registration required. Active Living – Harvest Crafts, Five Points West Regional Branch Library, November 22, 10:30 a.m. – Participants will have a fun time making holiday crafts. As beautiful and romantic as this time of the year is, it carries with it a few challenges that we must all be aware of and be equipped to face. It is tempting to place most, if not all, the blame on the hustle and bustle of preparing for the holidays, but there are other and more important challenges that we face, which is staying healthy. Alabama’s weather is volatile and strays off script during any season, but more people tend to get physically sick during the fall. Some people even experience seasonal depression termed Seasonal Affective Disorder or SAD during this time of the year as well. Fortunately, there are several resources available at the Birmingham Public Library that will help us all take a more proactive approach in combating both physical and emotional challenges that accompany winter seasons. Check them out below! Interviewer: Today we are visiting with Spike Pricklepants, North Birmingham Library’s resident Hedgehog. Mr. Pricklepants, wake up please. I need to ask you some questions. Spike! Spike: Why must you interview me during the day? You know I sleep during the day. Come back when it is darktime. Interviewer: You seem to be awake now. So let’s get started. I have to ask you first how you got your cute and very appropriate name? Spike: The children at North Birmingham Library named me that. Ask me why? Interviewer: Umm, why? Because you have a prickly personality? Interviewer: Yes you do. But what other reason then? Interviewer: How long have you lived at the North Birmingham Library? Spike: (yawn) 2 years, 2 months, and 4 days as of this Thanksgiving, 2017. Interviewer: I’ve heard of the “Terrible Two’s” when a toddler begins to be a bit more troublesome. I’m not calling you terrible, but why do you insist on relieving yourself next to your litter box the day your cage is cleaned? Spike: I don’t do that! Spike: One time I didn’t! Spike: That is a dumb question! 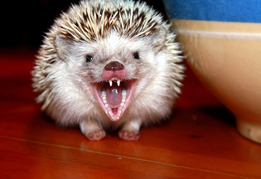 Hedgehogs are not cannibals! Ask Sabastian; his kind does eat their young! Interviewer: Oh. Never mind. Ok, so what is the coolest thing that has ever happened to you at the library? Spike: Well, once when I was young and foolish, I found my way out of my big new cage! The Silly Folks put my cage onto the floor in the Zoobrary; wasn’t that thoughtful? During the day I slept on the bookshelf where the 900 number books live. But at night, I went into my cage to eat, drink, play and relieve myself. I am the smartest animal in the library; I knew that pooping anywhere else would give me away. Besides, I am very tidy! Interviewer: I happen to know that you are anything but tidy! Anyway, how did you end up back on a shelf in the Zoobrary? Spike: It’s all very simple. One Monday night I went into the cage before the library closed at 8:00. The Silly Folk walked over and closed my door! Just like that, I became a caged animal again. But I really did it on purpose. I’m too smart to get caught if I didn’t want to be. Interviewer: Yeah, right. How long were you out? Spike: I was out for 10 days, 3 hours, 42 minutes and 16 seconds. But, you know, freedom isn’t all it’s cracked up to be. I don’t think the Silly Folks knew there was a mouse running around loose too. He was kind of nasty and scary. I avoided him like the plague! Huh, get it? The plague. Interviewer: Did the mouse mess with you or your cage? Spike: No way, Jose! I flared up my spikes one time, and he vacated the whole children's area! Interviewer: I happen to know that you are a very popular part of North Birmingham Library’s grubdown program every Tuesday afternoon at 4:00. Do you enjoy grubdown? Spike: Heck yeah! grubdown stands for grub worms! I love grub worms! Interviewer: Grubdown does not stand for grub worms. The program is called grubdown because as well as petting, holding, and brushing the pets, patrons get to feed them. Spike: Well, whatever. Did you notice that I root around the ground like a pig does, sniffing for grub worms or other bugs? My nose is actually a lot like a small version of a hog. Thus, the “hog” part of my description. Then, the “hedge” part is obvious, too. Aren’t I an interesting fellow? Interviewer: Why yes you are! Of course I have to ask your favorite book. Spike: What do you want to ask my favorite book? Interviewer: No, no. What is the name of your favorite book? Spike: Well, I kind of like books about Sonic the Hedgehog. Interviewer: Those are fiction books. Do you ever read nonfiction books? Spike: Yes, I love nonfiction! When I was loose, I read a lot of books in the 900 area. I am pretty smart, you know. I know where I came from! Interviewer: Really? Where did you come from? Asia? Interviewer: Well since you’re an African Pygmy Hedgehog, I’d say you came from Africa. Interviewer: OK, I give up. Where did you come from then? Spike: Ha! I came from Ed’s Pets. Interviewer: Alrighty then. You like books that teach you things. Spike: I read all the books in the Zoobrary about my fellow pets. They are all weird! Interviewer: They are not weird; each one is just different. Spike: You know what’s not fair? Jabberwocki never gets waked up! Interviewer: We don’t have to. Jabberwocki likes daylight and sleeps at night. He is diurnal. Spike: No wonder I am grouchy! You Silly Folks wake me up all the time…you argue with me…and never put a book in my cage for me to read…before I…go…to…sleep. Interviewer: Well I suppose that’s all the answers I’m going to get, since you have rolled up into a ball. Would you like a grub worm? Interviewer: Well, thank you Spike Pricklepants. I hope the readers learned something about you today. Choosing a career is not any easy undertaking. Likewise, once you’ve chosen a career, finding a job can be a pretty difficult task as well. When you consider that throughout your lifetime you spend more hours at your job than you do anywhere else, you really need to put the time and effort into making good decisions in regards to career selection and job searching. This is not only true for young people who are entering the job market for the first time, but also for adults who are either reentering the job market after an absence, looking for a new job, or are contemplating a career change. 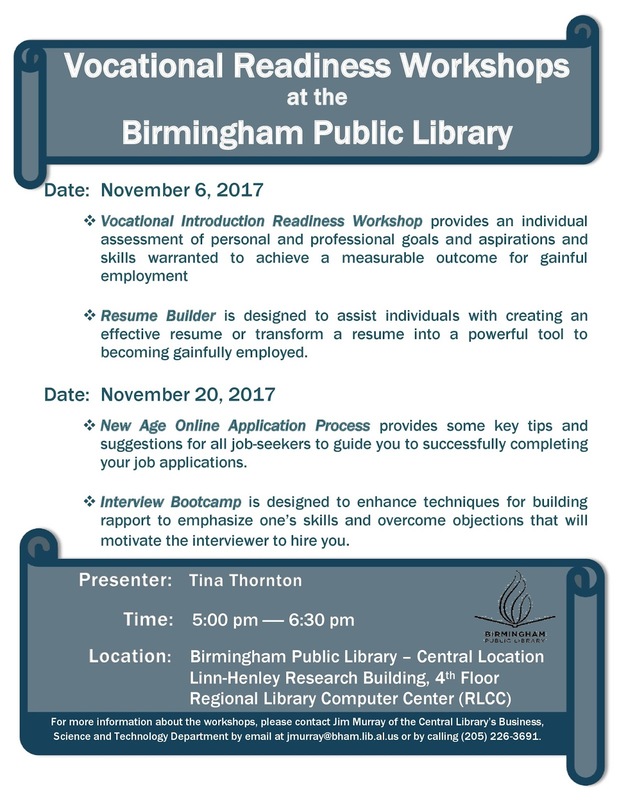 If you fall into any of these categories, then you should plan to attend the Birmingham Public Library’s Vocational Readiness workshop. Monday, November 20, 2017, 5:00-6:30 p.m.
New Age Online Application Process offers tips and suggestions to guide all job seekers in successfully completing online employment applications. Interview Bootcamp teaches techniques to help you emphasize your skills, overcome objections, and build rapport with your job interviewer. The workshop presenter is Tina Thornton. Tina is a professional counselor and founder of Gem Kreations, a nonprofit organization committed to assisting those who have experienced adverse circumstances realize their full personal and professional potential. For more information about the workshops, please contact Jim Murray of the Central Library’s Business, Science and Technology Department by email at jmurray@bham.lib.al.us or by calling 205-226-3691. Registration required. Limit 12 participants. Register online through the events calendar or call Leslie Deason at 205-226-3677. 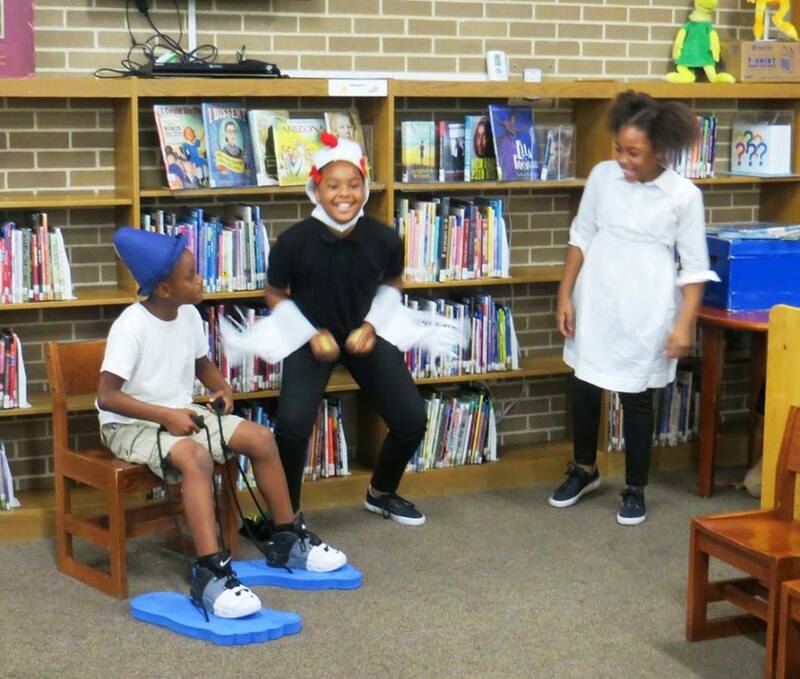 Daily, the Birmingham Public Library's 19 locations across the city provide free programs and services, showcasing value far beyond being a place to check out books and DVDs. 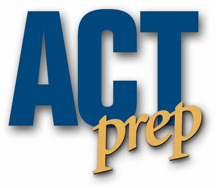 The Smithfield Branch Library’s free ACT prep classes and tutoring services for teens—offered weekly on Tuesdays, Thursdays, and Saturdays—is a prime example. The Smithfield Library will use BPL’s free database, Learning Express Library, which offers practice sessions for the ACT. Tuesday, November 14, 3:30-5:30 p.m.
Thursday, November 16, 3:30–5:30 p.m.
Saturday, November 18, 9:00 a.m.-1:00 p.m. and 2:00-6:00 p.m. These sessions are meant to help with the four required sections of the ACT: English, Math, Reading, and Science. Advance registration is required. Register online through the Birmingham Public Library events calendar, or call the Smithfield Library at 205-324-8428. Can Reading Be Embraced Again? A new school year is well underway for students. So, the fight to get them focused on all that is school has begun. Summer allowed students the freedom to more than likely use their tech gadgets until their heart’s content. Now, parents and teachers will have to be the “bad guy” and put forth steps that will temper the desire for students to use these devices so frequently. Most students do not have an inkling of what it was like before smartphones, video games, social media, texting, and the many other tech formats that engross their lives now. As a student, I was just on the cusp of technology integration. This was when items such as cell phones were simply used to talk. Now, it is amazing that you can video chat, discover the exact location of places, and have an app for almost anything you can imagine to assist with the tasks of your daily life. Smartphones, games, computers, apps, etc. have really spoiled all of us. They are created to make users feel that they cannot live without them. The impact that technology has on students is real. Students now desire instant gratification and that is exactly how many of the games and apps that they use are designed. One of the residual effects of all of the technology is that students have low attention spans. This leads me to think about the steady decline in students reading for pleasure. Technology is entertaining and satisfies immediately but reading is a commitment. Reading a book is a commitment that may take hours to days to complete. Many students simply would rather spend their time doing something other than reading for the pleasure of it. Visualization is when the words and the ideas on the page trigger mental images that relate to what is being read in some way. These images are like movies in their heads, and this increases their understanding of what is being read. Students of the tech generation may have a harder time with creating mental images on their own because current technology has numbed that skill for many of them. Images are being created for them through graphics, sound, design, etc. They are receiving instant stimulation through YouTube, Facebook, texting, and so many other formats. Reading for pleasure is simply not a high priority for most students because it takes more effort in comparison to what technology has to offer. Visualization is a very important reading skill that is needed in order for deep reading to occur. How can this skill be strengthened? There is not a quick fix for this; however, introducing students to a variety of books that assist in strengthening their ability to create mental images as they read is a start. Embracing reading and taking time for deep reading is a goal that parents and teachers should set with students. 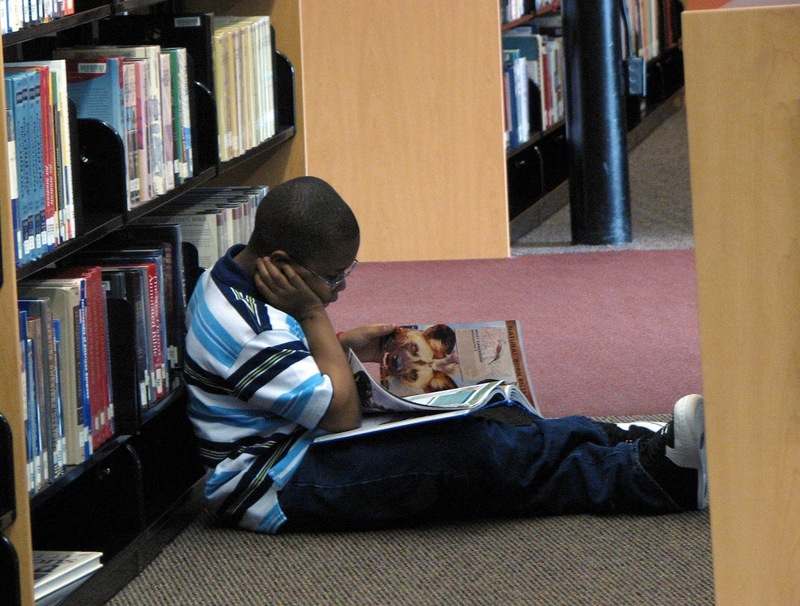 It is not unreasonable for students, depending on their age, to become acclimated to the habit of reading for 30 minutes to an hour a day sans technology. Below you will find a list of books which use a mixture of sensory elements that encourage readers to visualize as they read. Search the JCLC catalog for these books and more. 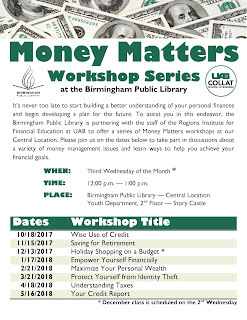 The Birmingham Public Library is partnering again this year with UAB’s Regions Institute for Financial Education to offer a series of Money Matters workshops to be held each month at our Central location. Each of the workshops covers a different topic, but all are designed to help you gain a better understanding of your personal finances and begin making a plan for the future. All workshops will be held in the Youth Department’s Story Castle, which is located on 2nd floor of the Central Library. Representatives from the Regions Institute for Financial Education in UAB’s Collat School of Business will serve as instructors for each of the workshops. 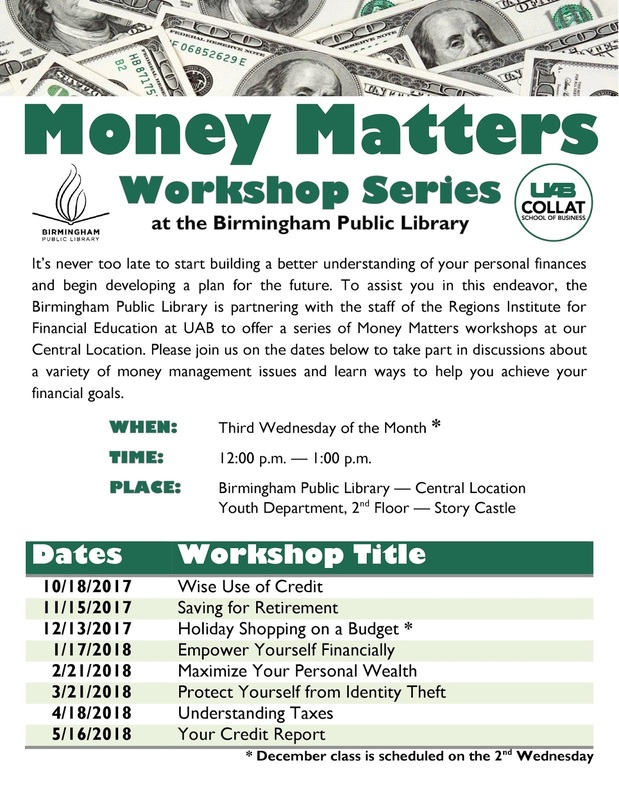 To learn more about the workshop series as well as other personal finance resources available at BPL, contact Jim Murray of the Central Library’s Business, Science and Technology Department by email at jmurray@bham.lib.al.us or by calling 205-226-3691. Below is a listing of the Money Matters workshop series by month through May 2018. The workshops are held on the 3rd Wednesday of each month, with the exception of the one scheduled for December 2017, which will be held on the 2nd Wednesday. For many of us the phrase “what if” signifies something that we could only wish would happen for us. For example, What if I could travel the world and visit three different countries in the next five years? Or, What if I could win 50 million dollars tomorrow and never have to work again? Wishful thinking right? Well, not exactly. There are many different avenues to take where your wishes could turn into reality with just a little work. There are a number of books out there that can help you along the way. If you have a desire to travel to many different countries but you are on a strict budget, consider taking online surveys to earn points towards your travel experience, or check out online sites that will accommodate a payment plan on a much needed vacation. So now that you have your plan of action down, choose a location to visit. Your local library has tons of useful materials to aid you in choosing a destination or helping you invest the 50 million dollars that you are on your way to earning. Sounds great huh? Well check out our resources for saving up for travel, travel destinations, and traveling on a budget. Thanksgiving is upon us. 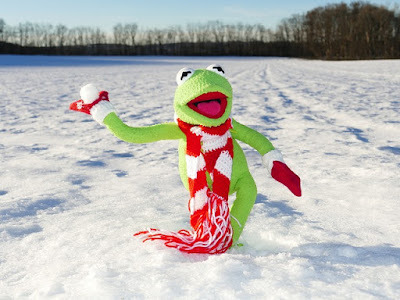 It seems like just yesterday we were roasting through a hot summer. Wait a minute! That was yesterday! Anyway, later this month, we will be gathering with family and friends to sit around, overeat, bring up all the family drama, and begin to think about what we can't afford to buy for Christmas. What a great holiday! For those of us who don't cook, we can't wait to visit someone's home, eat all we can hold, then take plates of food home to eat for the rest of the weekend. This blog is for you wonderful folks who are preparing the meals. Since I NEVER host, I thought I would give you, the reading public, some advice on Thanksgiving. Tip 1. Stop hosting every year - Some of you are sitting out there right now dreading the idea of Thanksgiving. 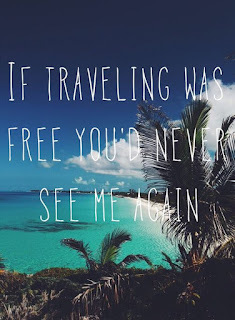 It's not because you have to fly or drive a long distance to visit family. It's because you are already picturing the throng of family and friends who will be descending on your home for Thanksgiving. I'm taking it back to Nancy Reagan in the 1980s, JUST SAY NO!!! It's time for someone else to put up with everyone's kids running around, tracking up the carpet, and breaking stuff. You have done your duty. If you must host, consider Tip 2. Tip 2. 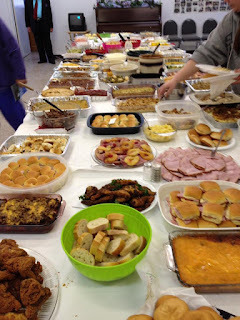 BYOT (Bring Your Own Thanksgiving) - I'm sure many of you already do this, but ease the burden on yourself by making Thanksgiving a complete potluck affair. I know mom typically stands in the kitchen for three days getting all those dishes cooked to perfection, but it's time to spread the love around. Don't leave the meal to chance either. INFORM your honored guests what they are REQUIRED to bring to make entry. We all have that family member who continues to show up with one 2-liter soft drink. Sorry Billy, that worked in the past, but it is not enough to gain entry into this year's festivities. Do NOT pass Go! Do NOT collect $200.00. If you don't understand this last reference, put the video game controller down and play some board games. Tip 3. 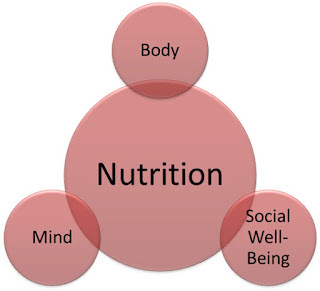 Don't prepare so much food - Let's be honest, this is not the first time your family and friends have eaten a meal. 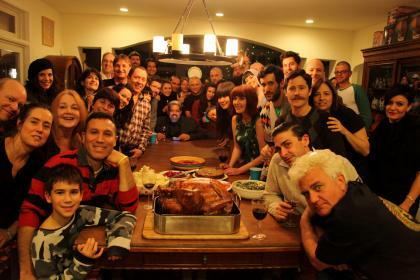 Tom Hanks did not leave the island in Cast Away and come straight to your house for Thanksgiving dinner. You want everyone to have enough to eat, but these are not bears getting ready to hibernate for the winter. 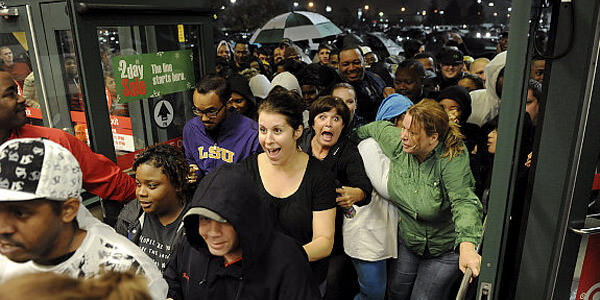 If people are still hungry, McDonald's will be open in time for early Black Friday shopping. Go ahead and give them the gift card you had planned to give them for Christmas. Not to mention, breakfast is served all day, so they have plenty of choices on what to eat. Tip 4. Get them out of your home in time to shop - Black Friday is now known as Thanksgiving. You KNOW that you simply MUST have that big screen TV and it's only available between 4:00 pm and 4:01 pm. 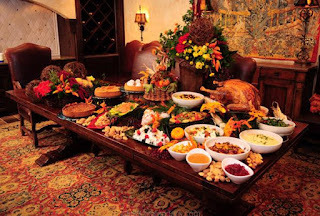 Do you really want to be stuck at the house watching people digest the large meals they just finished? Thanksgiving lunch is the key with a firm cutoff time for eating. If people try to linger around, start handing out assignments (clear the table, put away the leftovers, load the dishwasher, etc.). Before long, you will have an empty house and plenty of time to get ready to hit the stores. I hope all of you have a wonderful, festive, and stress-free Thanksgiving. Then, let's hit the stores!!! Those televisions are not going to buy themselves. Happy Thanksgiving! What: "World War One and the Making of the Modern Middle East"
Details: Free and open to the public. Refreshments will be served. For more information contact Jim Baggett at 205-226-3631 or jbaggett@bham.lib.al.us. World War I transformed the region we know today as the Middle East, expanding some empires while others crumbled, creating new borders, and forging new political identities. Dr. Annalise J. K. DeVries of Samford University will examine accounts from Maadi-Tura, an Egyptian prisoner of war camp, to explain how the war experience created new points of conflict, particularly as the Ottoman Empire fell and the British and French looked to assert authority over the region. 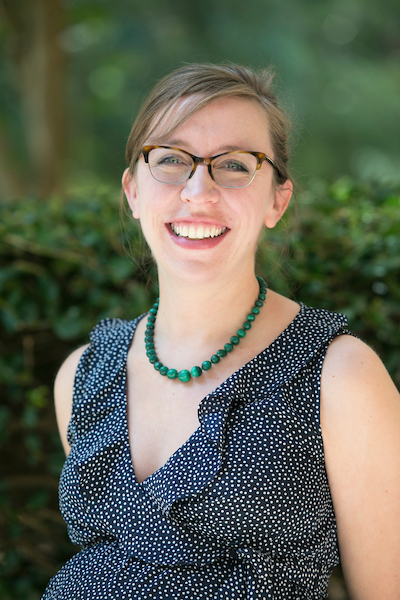 DeVries is assistant professor of history at Samford University. She previously taught at the University of Alabama and Birmingham-Southern College. Her professional interests include global and comparative history, imperialism, modern Egypt, the modern Middle East, and women’s and gender history. She is currently working on a book manuscript based on her dissertation research, which looks at Cairo, Egypt’s cosmopolitan society in the late-nineteenth and twentieth centuries. This program is presented in cooperation with Auburn University, the Alabama World War One Centennial Committee, and the United States World War One Centennial Commission. What: "Hearing a Different Drummer: William March's Novel Company K"
Details: Free and open to the public. For more information contact Jim Baggett at 205-226-3631 or jbaggett@bham.lib.al.us. Dr. Bert Hitchcock of Auburn University will discuss the often forgotten novel Company K. Written by Alabamian William March, a decorated Marine combat veteran, Company K is America's most powerful World War One novel. Courageously different in his outlook and strikingly innovative in technique, March has never received the full recognition he deserves. In its portrayal of the horrors and atrocities of war, Company K is among the best war fiction ever written. Hitchcock retired from Auburn University in 2008, where he was the Hargis Professor of American Literature. A graduate of Auburn, he holds degrees from the University of Oregon and Duke University, and he also attended the University of Melbourne in Australia. From 1966 to 2008 Dr. Hitchcock held several positions, including assistant director of admissions, chairman of freshman English, and department head from 1977 to 1990. He regularly taught classes ranging from freshman survey classes to doctoral courses; his area of interest is nineteenth-century American literature and Southern literature. Hitchcock's contributions to the study of American literature include the American Short Stories anthologies he edited for decades, and his entries and essays on American writers for a number of established reference books including the Dictionary of Literary Biography, Reference Guide to American Literature, and Contemporary Fiction Writers of the South. His books include De Remnant Truth, Down the River, The Flush Times of Alabama and Mississippi, and Chinaberries and Crows. In 2008 Hitchcock’s former students helped establish the Bert Hitchcock Award in Southern Studies. Generous financial support for these programs is provided by the Rita C. Kimerling Family Fund. Update: The Government Documents Department is now open to the public. The Microforms Department will remain closed until November 20. Due to HVAC upgrade and maintenance in the Linn-Henley Research Library/Central Library, the Government Documents/Microforms Department is closed to the public until November 6, 2017. Equipment for reading and scanning microforms is available in the Southern History Department. Patrons may call ahead (205-226-3665) to have film and/or fiche pulled. Since this is a tentative re-opening date, we recommend checking the Birmingham Public Library website for updates. We apologize for the inconvenience. The Birmingham Public Library's seven neighborhood branches will begin their winter hours operating schedule beginning Monday, November 6, 2017. The change comes with the end of daylight saving time on November 5. Neighborhood libraries—East Ensley, Ensley, Inglenook, North Avondale, Powderly, Woodlawn, and Wylam—will maintain this temporary schedule through early March 2018 when daylight saving time begins. The hours of operation will be Monday, Tuesday, Thursday, and Friday from 8:00 a.m. until 12:00 p.m., and from 1:00 p.m. until 5:00 p.m. On Wednesdays the libraries operate from 1:00 p.m. until 5:00 p.m. These locations are closed on the weekend. 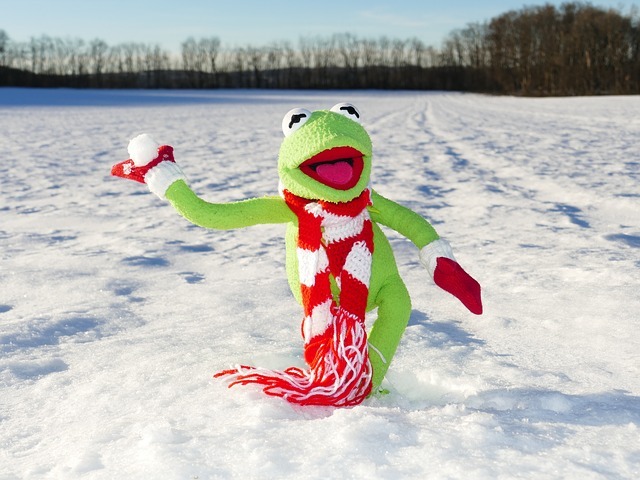 All other BPL locations will maintain their regular schedules. Between hurricanes, earthquakes, wildfires, politics, and everything else that is going on in the news recently, I was searching for a book that I thought might provide me some much-needed comic relief. Not one to read memoirs, I took a chance on Kevin Hart’s first book, I Can’t Make This Up: Life Lessons. My selection was based on Hart’s appearance in several recent box office hit comedies and it didn’t disappoint. Hart doesn’t hold back in providing details about his challenges of being born into a household where his birth wasn’t a celebration but a toleration. From a father who lived in a criminal environment to his overprotective mother determined to keep him off drugs and out of gangs, Hart had an opportunity to see the sides of both worlds. One of Hart’s earliest life lessons was witnessing his brother being kicked out of the house for selling drugs, combined with a less than twenty-four hour overnight stay at his father’s residence in which he witnessed the lack of structure and stability he was accustomed to with his mother. Both of these early lessons (along with many more on his journey) helped instill in him a drive and determination for success through hard work. Hart writes openly about his relationship with his first wife Torrei and the love and struggles they endured as he juggled climbing the ladder to success with being a father and a husband. The relationships and bonds made with other comedians who were there at his lowest and highest points also play a key role in Hart’s life lessons. While the novel certainly has some laughs, Hart also takes a moment to share some serious pieces of advice with the reader. Many believe that Hart was an overnight comedic sensation, but his novel takes us through the almost twenty years of "life lessons" that helped shaped him and reach a level of success. 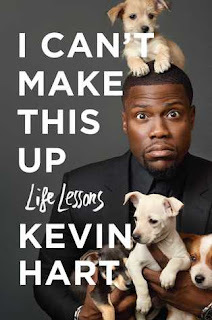 Take a break from the news and enjoy a good laugh—check out Kevin Hart’s book, I Can’t Make This Up: Life Lessons, from the library today! The Birmingham Public Library (BPL)’s Southern History Department is hosting a variety of genealogy classes during the month of November, including Ancestry.com and Family Tree DNA. Plus, the BPL Archives Department is hosting two great WWI programs on Sunday, November 12 and Tuesday, November 14. Southern History is making one major change to its 2018 Beyond the Basics of Genealogy workshop schedule, switching all workshops to Sunday afternoons. Two well-known genealogists, Donna Cox Baker and Frazine K. Taylor, will be special guests, sharing the Beyond Kin project. Beyond Kin is featured in the November issue of Alabama Heritage. Below is a listing of upcoming workshops hosted by the Southern History Department. Workshops are free of charge, but registration is requested. Register online through the BPL events calendar, or contact the Southern History Department of the Birmingham Public Library at 205-226-3665, or call the offsite workshop location. Ancestry.com – Participants will be introduced to the Ancestry.com Library Edition database in which you can research your family history as well as learn how to search this database to locate your ancestors. For more information or directions, please call the Irondale Public Library at 205-951-1415. Ancestry.com – Participants will be introduced to the Ancestry.com Library Edition database in which you can research your family history as well as learn how to search this database to locate your ancestors. For more information or directions, please call the Vestavia Hills Library at 205-978-0155. World War I and the Making of the Modern Middle East – World War I transformed the region we know today as the Middle East, expanding some empires while others crumbled, creating new borders, and forging new political identities. Dr. Annalise J. K. DeVries of Samford University will examine accounts from Maadi-Tura, an Egyptian prisoner of war camp, to explain how the war experience created new points of conflict, particularly as the Ottoman Empire fell and the British and French looked to assert authority over the region. Family Tree DNA Services and Website – Explore the offerings of Family Tree DNA, a company that offers hundreds of different DNA tests and that supports them with the most detailed website in the industry. For more information or directions, please call the Bessemer Public Library at 205-428-7882. Introduction to Genealogy – Want to learn how to do genealogical research? Come to this introductory class that will help get you started on your genealogical journey. The Beyond Kin Project: Making the Slave Connection – Project cofounders Donna Cox Baker and Frazine K. Taylor will teach a software method and research techniques for handling the unique complexities of plantation genealogy. Descendants of both slaveholders and enslaved persons will learn how to find and account for the under documented and often nameless plantation members using common genealogy tools. Nosing Around in Newspapers – Newspapers can be a genealogist’s best friend with the wealth of information found within its pages, but also a frustrating source. Learn how to locate the newspapers you need and how to efficiently search them to discover everything from an obituary to a scandalous news story involving your ancestor. Understanding DNA Ethnicity Test Results – Discover how DNA testing companies determine ethnicity percentages and what these estimates mean in terms of your genealogy. “Johnny Has Gone For A Soldier”: Military Records in Family History Research – Did one of your ancestors go to war? Explore the major repositories and databases for military records and discover how they can contribute vital information for your family history research. For more information about BPL’s Southern History Department, go to http://www.bplonline.org/locations/central/southern/ or like its Facebook page at www.facebook.com/SouthernHistoryBPL. Jahman Hill was born in Rochester, New York and raised in Larned, Kansas. He currently lives in Tuscaloosa. 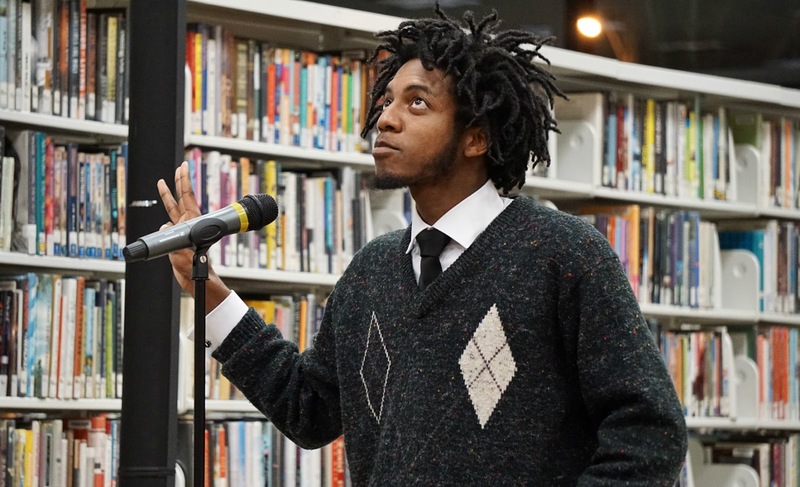 Hill is a poet, a student, a teacher, and the author of Made From My Mother's Ceilings. He regularly performs at Bards & Brews, the Birmingham Public Library's popular spoken word poetry/craft beer event as well as at other spoken word poetry events in central Alabama and across the nation. How long have you been performing spoken word poetry? I started writing and performing when I moved to Alabama four years ago, my junior year of college. Can you tell us about the first time you performed your poetry in front of a crowd? The first time I performed was at a variety show, I believe. I was a junior in college, and the University of Alabama theater organization, Alpha Psi Omega, were doing their monthly Guerrilla Theater. I performed three poems, and had an absolute blast. Who are some of the poets or writers that have had the most impact on you? I have been impacted by a plethora of poets, but those who have had the biggest impact are probably my mentor, Michael Harriot, and my friend, Eric Marable, Jr., who encouraged me to write in the first place. Poets who have greatly influenced me include Dominique Christina, Hanif Willis-Abdurraqib, Zora Howard, and Joshua Bennett. What art or artists (in any medium) are you most interested right now? I'm very interested in the work of Jamila Woods as of right now, as well as the local arts scene of Tuscaloosa. Visiting the Kentuck Arts Festival of last week was very inspirational. Which of you poems has had an unexpected reaction by an audience? I have this poem called Cash Me Ousside about the Cash Me Ousside girl, and people have really enjoyed it. My poem on kneeling has also received a reaction I wasn't expecting. I am actually nervous about a lot of my work. Do you have an ask of the readers of this interview? Ask yourselves how you can use poetry to challenge the society around you, how you can utilize poetry to grow, how poetry can empower you and others as well. Do you have anything you would like to promote? 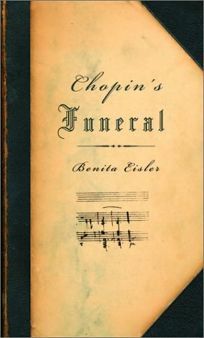 Benita Eisler’s Chopin’s Funeral is a biography of an affair, a love affair drenched in regret and melancholy for lost ephemeral moments of sublime beauty. Fittingly, it opens with the 39-year-old genius’s funeral at the Church of the Madeleine in Paris, mobbed by thousands. Few would have known Chopin or would have heard him play. They knew him through the sheet music they bought and played at home on their new pianos. His great love, the novelist George Sand, was not at the Madeleine. Sand and Chopin were estranged at the end. Frederick Chopin and George Sand (the pen name of Amantine Lucile Aurore Dupin) were opposites. He was very short, very slight, fair, sickly, and reticent; she was warm, dark, amorous, large, and exuded health. But both of them were pioneers of the Romantic Movement and were among the first artists making their way by sales to the general public, rather than living off the patronage of aristocrats. They were celebrities and they lived well in 1840’s Paris and at her French country chateaux, in the company of their friends, Franz Liszt and Eugene Delacroix. Sadly, the passionate natures they held in common, drove them apart. Chopin’s sicknesses, primarily tuberculosis, were his unwelcome companions from his youth in Warsaw, Poland. As one reads, one wonders how such a small weak man could achieve such masterful compositions for the piano, an instrument new to the world in his day. Ultimately Sand was cruel to Chopin, but she went to great lengths to care for him during the years they were together, as he struggled to breathe for months and months at a time. His sickness often prevented him from working, and he felt humiliated by her financial support. Nonetheless, all who heard Chopin play were struck by the strength of his performances. Chopin’s Funeral fills in many historical blanks for those of us seeking to understand the glory of French art and the art scene of that era when they and their friends Delacroix, Hugo, and Balzac were young. Benita Eisler’s biography of a British Romantic Movement avatar, Byron, Child of Passion, Fool of Fame has also drawn high praise. Birmingham Public Library. 2100 Park Place, Birmingham, AL, 35203. Theme images by Deejpilot. Powered by Blogger.